You are here: Home / Blog / What are the Methods for Upholstery Cleaning? What are the Methods for Upholstery Cleaning? Couches and sofas are the pivots around which busy life revolves in your bustling living room. Children and pets jump on them and roll around, and lounge on them practically the whole day. So how do you expect them to stay pristine and fresh? How well can they withstand the onslaught of all the lively people running about in your house? The upholstery in your house may not seem as prone to dirtying as the carpets, but the fact is they fare no better. They are open and vulnerable to all that comes into your house, and play host to a vast variety of unpleasant occupants. Your Favorite Couch Is in Dire Need of Cleaning, and How! 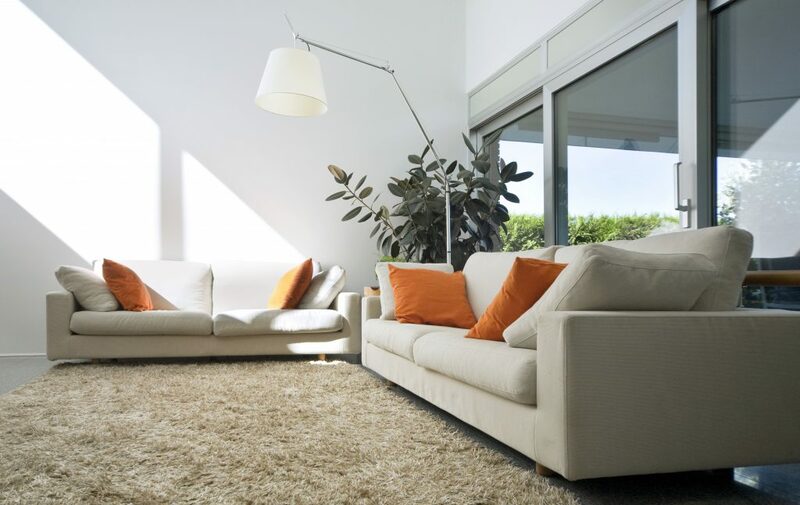 Couches are very much like carpets and act as filters to all the dust and dirt flying around in the air of your home. The particles get trapped in the fabric and the soft cushions, and accumulate there. If you have pets, pet dander and body secretions from your furry friends will definitely get trapped in your couch. The couch is also home to millions of skin cells that our body sheds on a daily basis. The skin flakes provide a sumptuous feast to invaders of a nastier variety –dust mites. These microscopic creatures creep into your couch, feed and thrive on the skin cells, and multiply rapidly. They not only live and grow but also poop on the couch! This might seem downright disgusting, but there are other more dangerous side-effects as well. The faecal pellets of dust mites are common causes of allergies in children and elderly, and in severe cases result in asthma and other troublesome illnesses. Also, if you are a regular entertainer and love throwing parties, your couch is at the receiving end of food droppings, spills, stains and sweaty bodies. Sweat makes your couch moist and more prone to mould and bacteria infestation. Throw in the common contaminants found in household air like cooking oils, pollen and harmful chemicals from household cleaning products, and you have a very, very dirty couch! There, now you see how unhealthy, unsafe and unhygienic your couch becomes over a period of time. DIY home cleaning helps give a cosmetic facelift to your couch. But if you well and truly desire a deeply cleaned, sanitised and hygienic couch, it is time to call in the experts. Professional cleaning ensures your couch is stripped of all allergens, soils and microscopic organisms. After a thorough job by the professionals you are left with a fragrant, healthy and fresh couch. Let’s see how professional cleaners give the best care and cleaning to your couch. Protect your upholstery with our professional cleaning today. The technician thoroughly inspects the couch to determine if there are stained or heavily soiled spots on your couch. Armrests and the front portion of the couch where our legs rest are the usual candidates for intense cleaning. These areas have body oils, skin cells and dirt accumulated over them resulting in the soiled and dingy look. Your professional cleaner will focus extra attention on these areas to give you the best results with the cleaning. He will also detect if there are any structural defects like broken parts or damaged fabric and suggest remedial measures. Ideally you should perform professional cleaning only on furniture that has been repaired and is free of loose hinges and other assembly parts. We vacuum our carpets religiously every week. This helps remove all the dust, dirt and dander that has accumulated in the carpet over the week. But while we give meticulous care to our carpets, we often overlook the dire state our upholstery is in. And professional cleaning helps remediate that. The technicians will give your upholstery a complete, deep and thorough vacuum using the upholstery tool of the vacuum. This helps remove the deep-seated dust and other microscopic debris from your couch and loveseat. The trained cleaner will ensure he covers every nook and corner, crack and crevice, and sanitises them. The cleaner then applies a pre-spray on the carpet that breaks down the stubborn soils and loosens them. The deeply soiled areas are given a more intense application and considerable dwell time is allowed to help the chemicals work their magic. Dwell time is the duration that the spray is allowed to rest on the upholstery. This allows the solution to work deep, dislodge and suspend the dirt, and thus pave way for an effective and thorough rinse. Professionals will be able to determine the correct usage of pre-spray for your upholstery to remove even the most deeply embedded dirt and soils. Once the soils have been dislodged and agitated, the professional cleaner gives a complete and a thorough rinse to your couch. A gentle and effective rinse solution and hot water combine to give a powerful wash to your couch. Trained and experienced cleaners use a jet-less upholstery tool for soaking and extraction that is most suited for upholstery and mattresses. It ensures the couch is not over soaked and the powerful suction also draws out excess moisture along with the suds, thereby giving you a fresh, fragrant and clean couch. The last and final step is extremely important if you don’t want to end up with a moldy, mildew-ridden and smelly couch. A damp couch with damp cushions is a mould-magnet and results in microbial infestation, which is surely something you would not want after the laborious cleaning efforts. A professional cleaner will help you re-discover your lovely couch from beneath the envelope of dust, dirt, soils and grime. Your living room regains its charm, and your interior décor is in ship-shape again. So, call in the experts to give you the best results.